Sony Playstation 4 is now available for Pre-Order in India through Flipkart.com. You may book your PS 4 but the pricing seems pretty high than what it suppose to be. In U.S the pricing is $399 for PS 4 and you may find some deals at amazon for sony ps 4 at times and get some discounts. 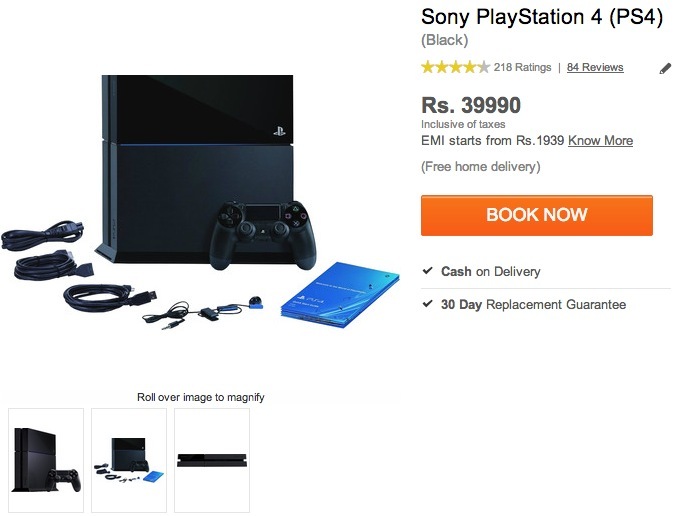 Flipkart came up with its regular pricing method with Sony PS 4 as well. Its almost double the actual pricing and we recommend, if you can get one from U.S then go for it, to save money and buy some PS 4 Games. If you cant wait to get your Hands on PS 4 then go and Pre Order on right away. Flipkart also gives EMI options and Cash On Delivery for this booking. In the box you will get following items with 500 GB Sony PS 4 Gaming Console.